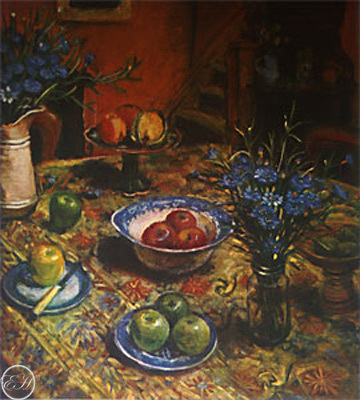 Margaret Olley original fine art etching titled – Yellow Tablecloth with Cornflowers, released in September 2007 to a limited edition of 75 only, this multi-plate fine art print works on paer is form a coloured etching plates,the fine printed art work is hand signed. Image size: 65 cm x 59 cm, Paper size: 97 x 79 cm, No of plates: 4, No of colours: 6. $11,000, Etching House has a 12 month lay buy plan available with no fees on 20% deposit. Etching House buy Oil Paintings, Etchings, Collagraphs, Giclee digital fine art prints by Margaret Olley.